What do we in the West know about Islam? Perhaps more than we did before 9/11 but not much. Professor Samuel Huntington of Harvard University had written that it wasn’t fundamentalism that was the problem, it was Islam itself. He argued in his bestselling book, The Clash of Civilizations that “The twentieth century conflict between liberal democracy and Marxist-Leninism is only a fleeting superficial phenomenon compared to the continuing and deeply conflictual relationship between Islam and Christianity.” He foresaw nuclear war between the West and Islam. This seems to be extravagantly over the top. Yet there are many Islamic scholars who make, like Huntington, a departure from what are the historical facts, but going in the opposite direction. One is the Oxford professor of contemporary Islamic studies, Tariq Ramadan, in his book, Islam: The Essentials. Quite rightly, he stresses that in the first 12 years of Islam’s existence Mohammed’s followers did not retaliate when persecuted, tortured, and murdered. But, as Ramadan argues, the Koran also said: “Permission to fight is given to those against whom war is wrongfully waged.” Legitimate self-defense was blessed. Ramadan appears to suggest that this is as far as it goes. No offensive violence. But Ramadan omits to mention the Koran’s verse 9:29: “Fight those who do not believe in Allah, nor in the Last Day, nor forbid what Allah and His Messenger have forbidden, nor abide by the religion of truth.” Offensive violence is sanctified. It is this verse that sustains the fundamentalists in Al Qaeda and ISIS. The truth is the Koran faces both ways. Mohammed himself was a general and spent much of the last ten years of his life fighting his opponents in Medina and pushing forward against Roman-occupied Arab lands. In this way he acted more like an Old Testament leader rather than the total pacific Jesus. Shortly after Mohammed’s death in CE 632, his father-in-law, Abu Bakr, took over the leadership. His task was to carry out the orders and plans of Mohammed. His first job was to recapture the tribesmen who had defected. To do so he unleashed on Arabia a war of unprecedented ferocity. Four years after Mohammed’s death he had conquered Syria too. After 10 years the great Persian Empire was subdued. This laid the basis for Islam’s rapid expansion to the frontier of China and the middle of France. Over the next two centuries it created a vast Afro-Asian-European empire. No other religion has expanded so fast, so far and so violently. None of these fights, apart from the struggle with the Quraysh, might be described as defensive wars. The non-violent verses of the Koran were contradicted by the teaching of verses 9:29 (and also 22, 39, and 45). 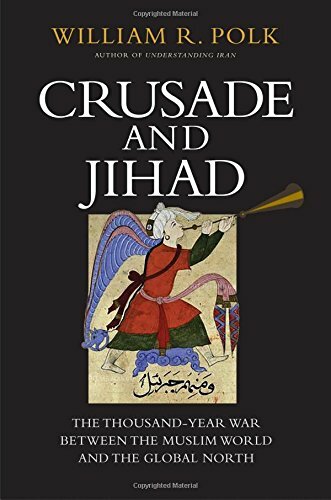 A new book, Crusade and Jihad by the esteemed William Polk, who taught Arabic literature and history at Harvard, is the latest writer to obfuscate this debate. It is a brilliant survey of the Muslim world and its advance. But on the issue of violence it fails to come clean, just as Ramadan and many other writers fail. The Western world’s most popular serious writer on religion, Karen Armstrong, is among them. But what Polk does successfully is to give the reader a detailed measure of Islam’s history. The relationship between Christianity and Islam is searchingly recounted. Christianity, thanks to the foundations laid by a converted Roman emperor, Constantine, became the most vicious and warlike of all the great religions. Its violence often put Islam in the shade and it didn’t exhibit the important virtue of tolerance practiced by Islam. When a part of the Christian world was conquered by Muslims, Christians were allowed to practice their religion and build their churches. Polk explains why the Christian world became dominant from the 15th century onwards: the growing lack of water in the Middle East, a series of small technological changes in Europe, including the use of printing on a large scale and the invention of the eyeglass. Most important, some have argued, is the sophisticated and technologically advanced way the Europeans made use of gunpowder and armaments. None of these, apart from the water issue, seemed to have been given the same urgency in the Muslim world. Now the Islamic fundamentalists want to overturn Christian/Western dominance. If they read this book they will realize they are probably on a hopeless quest. Nevertheless, to be honest, the Koran is—at least partly—on their side. Jonathan Power's most recent book is Ending War Crimes, Chasing the War Criminals. He is an author, filmmaker, and has been a foreign affairs columnist for more than 35 years,. He has interviewed 60 of the world's most famous political icons. His columns and articles have included in such publications as the International Herald Tribune, The New York Times, and The Washington Post. One of his documentaries for the BBC won a silver medal at the Venice Film Festival. For 17 years he was a foreign affairs columnist/commentator for the International Herald Tribune.